Product is, in fact, the range of the products (goods or services) that the organization offers to the marketplace. Decisions have to be made about quantities, timing, product variations, associated services, quality, style and even the packaging and branding. Price is a vitally important decision area because although it is a promotional tool in many respects, it is the main source of income to the organization. If prices are lowered for promotional purposes, the case flow within the company, and its long-term profitability, could be seriously affected. As with products, there is normally a range of prices. These can vary according to the quantities bought, the importance of the customer, and the market segment. pricing can be long-term and short-term. pricing can involve discounts, special offers, allowances, credit, and ‘trade-ins’. It is vitally important to get price decisions right. A business when planning its marketing will ask a number of questions relating to place i.e. ‘through which outlets should we sell the product? How do we physically move the product to these chosen outlets? How far a field do we wish to operate (locally, nationally, or internationally)? Place, or distribution policy, is a massive, complex decision area. 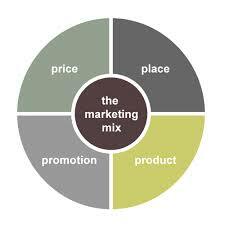 The Marketing mix gives a plan by which to operate to influence and satisfy the buyer/customers. The four Ps approach is not perfect, and is certainly not intended to cover all the marketing activities, e.g. Marketing research, research, of course, is the provider of information for the decisions in all of the four P areas.